I have a special love for authentic Mexican food, which differs from much of what we are served at typical American style Mexican restaurants. I am not an expert at cooking Mexican cuisine but I do love to play in my kitchen with the amazing flavors they use. There is nothing better than homemade salsa and I made my first tomatillo salsa last week and it came out fantastic. You can use it as a dip with tortilla chips or add it to your favorite Mexican dishes. In a medium pot over medium heat place the tomatillos in water. Cook for about 5 minutes or until tender. Place the cooked tomatillos and remaining ingredients in the food processor and process until smooth. This looks like a great salsa to go over meat like carnitas! It looks so good! Oh thanks for this recipe! I’ve been looking for a great salsa verde recipe everywhere. This looks wonderful. So delicious! I will try it soon. Must try this. I have never used tomatillos and shall look out for them as it sounds delicious. I love making tomatillo salsa, one because of the flavor and two, you can say “I made that” and people get very impressed. I’m about due to impress some folks again, will have to try your recipe. So vibrant and fresh! I haven’t had proper salsa verde for a long time. I should have paid more attention to mi abuelita cooking every summer vacation in Mexico instead of running around at the beach! Mexican food in nyc is craptastic! this is gorgeous and I love tomatillo sauce. We were just having a conversation at work about making an authentic Mexican salsa. I can remember a co-worker saying that tomatillos is the only way to really make a good Mexican salsa or verde. I will have to share your post with her. I love salsa verde–this looks delicious. I am going to try to get some tomatillos and try this soon. that’s a delicious dip!!! mmmm, with the garlic and the corainder, must have tasted great! 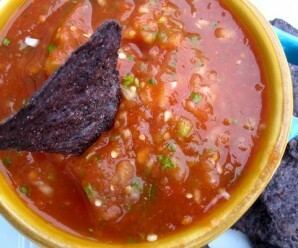 I have to say that once I had this version of salsa I was hooked. You would die if you saw how much I pour onto my rice and food when eating. Matter of fact I want it tonight for our dinner! I am a salsa addict too, lol! My dad’s fault when he brought chilies to our table as a youngster! 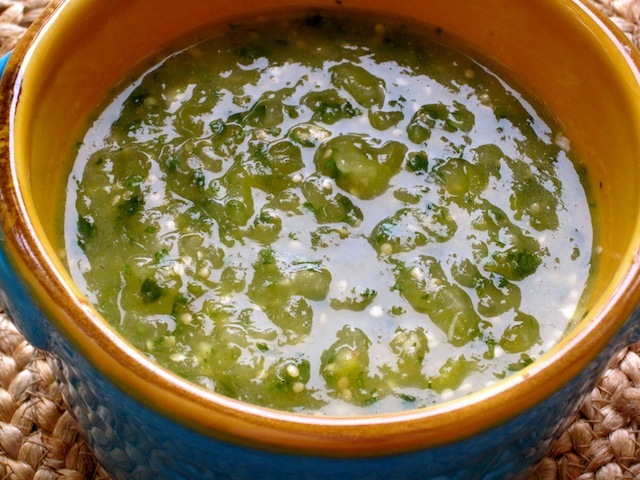 I love fresh salsa verde… and so easy to make! I adore tomatillo salsa! I would love to make my own! Looks s yummy – love the color! I made a tomatillo sauce a few months ago. I’ve had little experience making Mexican Food and while picking out my tomatillos I had a rather long conversation with several woman about how to pick a good tomatillo! It was fun and they were right, I made a delicious tomatillo sauce! ive been making salsa verde for years but have never added sugar or cumin. I’ll give that a try next time. I just love the color! Gorgeous .. I was introduced to salsa verde only a couple of years ago, and I gotta say I love it way more than the red salsa. Great recipe!